While my tree is nothing to brag about, I wanted to hurry and show you my new Glittery Monogram Tree Topper. I am in glittery love right now! Here, let me show you how I made it! But first, the weather has not been very pretty lately so the curb finds have been slim. I have high hopes though and have found a few things that I have not shared with you yet. 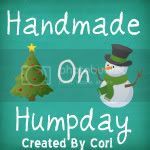 Until then, you will just have to bare with me sharing my craftier side! I have to let you know where I got the idea from. A few days ago on Scribbles and Swirls I featured a really neat Sparkly Monogram Tree Topper that I found over at Brooklyn Limestone. 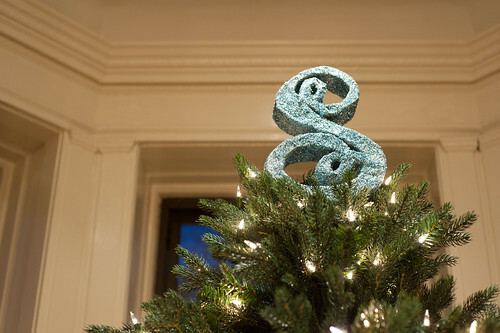 The “S” monogram is spectacular and so pretty in blue. Well today my blog friend, Katie from Sweet Girl Expressions, and I were emailing back and forth how much we loved this idea and how easily we could do it! Although I am in love with how the script letter “S” looks it has no use for our family. 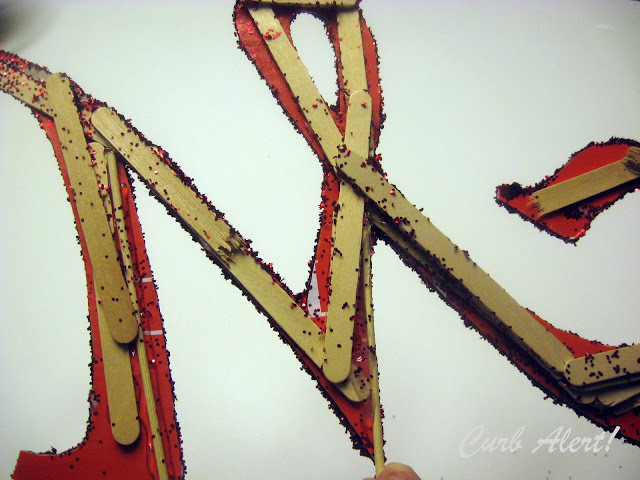 That’s okay though because I am also completely in love with the script letter “M”! I used the Vivaldi word document font size 440 and printed it out. 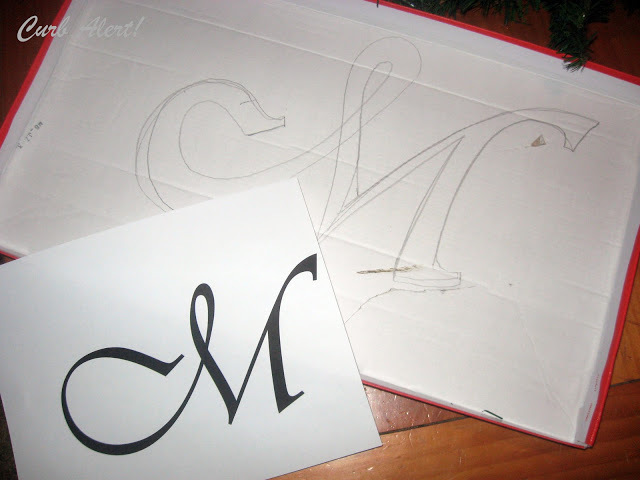 I copied and free handed it on a large shoe box top to enlarge it a bit more, and then cut it out. The next step was the fun part: Glue and Glitter! My LadyBug was using glitter to finish up her science project presentation so my kitchen is now a glittery mess! It seemed kind of flimsy so I decided to hot glue some popsicle sticks to the back for support. Next I glued some cooking skewers to the bottom so that I could perch it up into the treetop! It’s not quite as classy as the three dimensional “S” over at the Limestone but I didn’t have the time or patience to do that. So by the time I left for Bubba’s karate practice and back it was all dry and ready to go! I love it! I think it is quite impressive. I love love love monograms and have words, monograms and scripts all over my house so why not a glittery one on the tree, right? And here is one more picture up close on top of our 9′ tree! 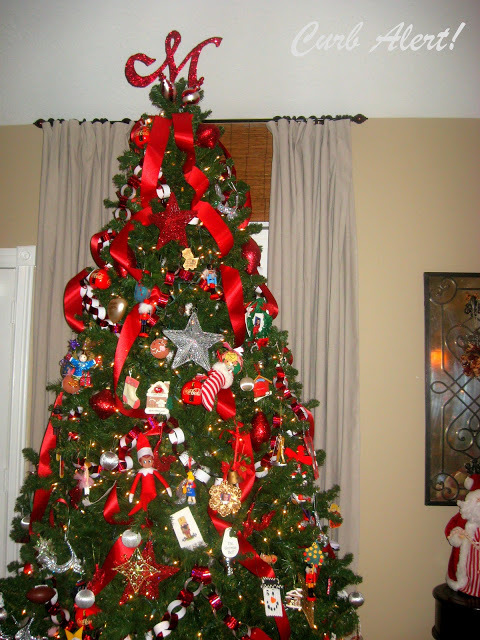 I finally finished decorating it, well the kids did! I think this is my favorite Christmas project by far! Thank you all so much for your encouragement. I really enjoy reading through your sweet comments. 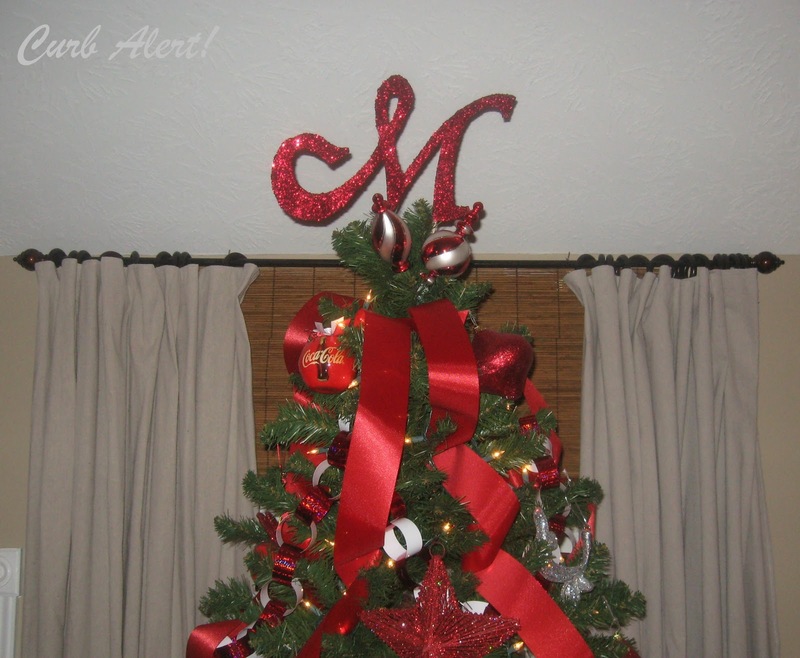 Tami, the monogram letter is beautiful and so is your tree! It is great inspiration and I think I will be trying it next year. Thank you for sharing! I LOVE this!! It's even more awesome because you made it yourself. Wish I could do something like this but my last name starts with "V" and that's just not as pretty as "M"! I love the ribbon on your tree too! Thanks Maria! and Jessica, I bet a "V" would turn out gorgeous with just the right font! Okay so now I'm thinking my tree topper that we've used for the last six years is a little blah!! This is awesome and could be used in so many areas – you rock! 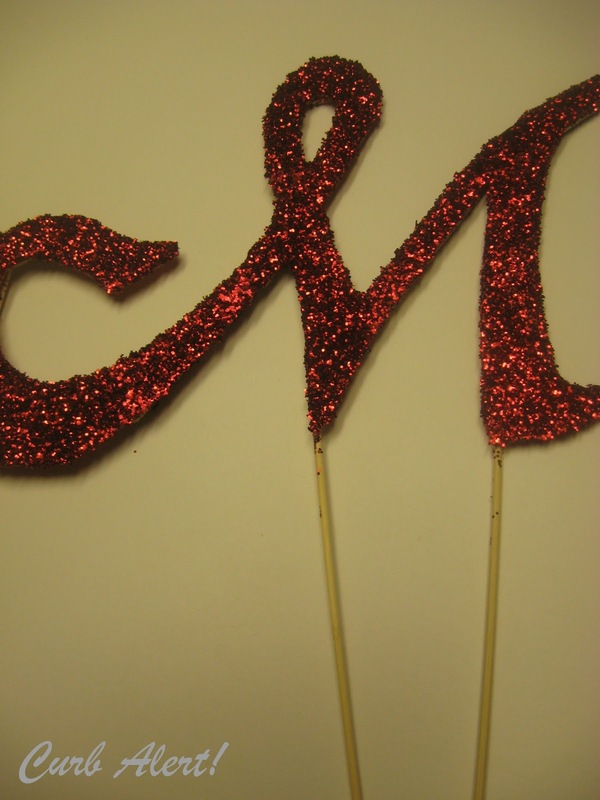 I am on a glittery roll, today I am thinking "what can I glitter up next?" My Love: Not so much! LOVE IT!! 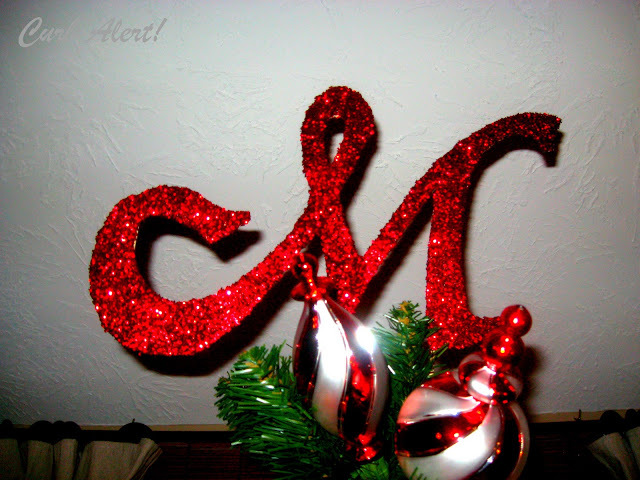 My tree is full of red glitter ornaments this year and a topper like this would have been perfect! I will definitely do it next year! Thanks for sharing. Wow that looks so good! Good job. 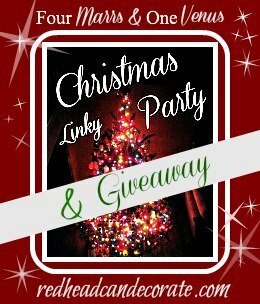 I would love for you to link up to my Christmas Party @ http://sewstylishboutique.blogspot.com/ I also have a Crafty Lassie Tuesday each week you can come and link up to. Tami I love this!!! I'm featuring it tonight at Project Queen's highlights. P.S. 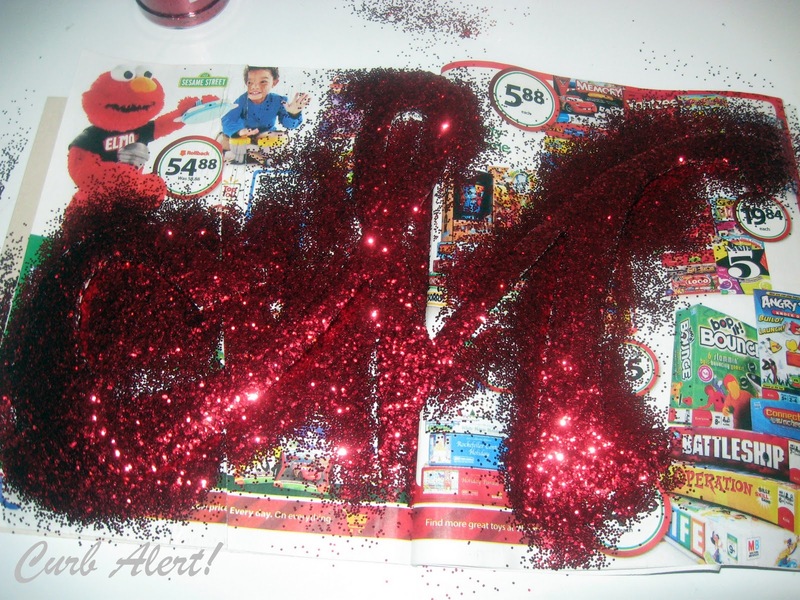 I'm still finding glitter everywhere…the price you pay for DIY, I guess! Merry CHRISTmas! Love the idea-we need a topper and I do believe this is what will go on top. THANKS FOR SHARING. @scrapfancy…I would love to see it when you are finished! One question tho….do you think I can double side it,so I can show it from inside and out? ?